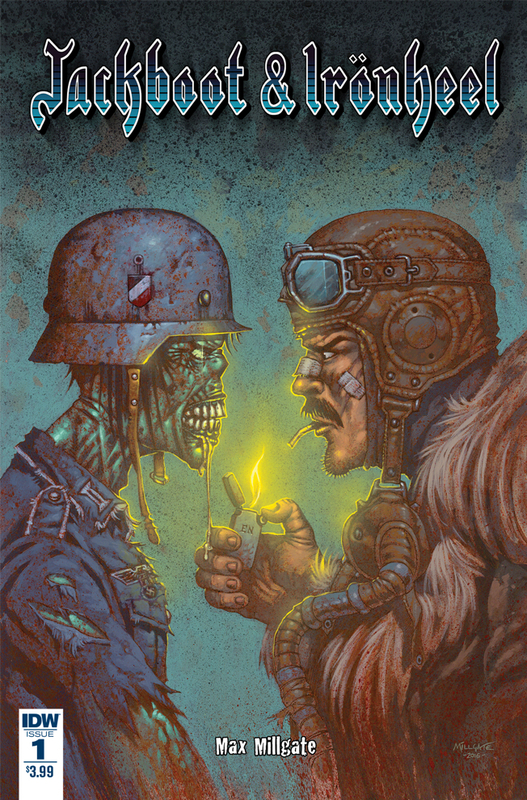 The Fellowship was fortunate enough to obtain a copy of JACKBOOT & IRONHEEL #1 from IDW Publishing. Max Millgate writes, draws and colors, and Shawn Lee letters. Eddie is a regular bloke, perhaps a bit rough around the edges, in pre-war England. He barely gets a chance to live his dream to become a footballer when Hitler begins his march into Poland. Eddie heads into the air corps, where he becomes a tailgunner. When his plane is shot down, his luck holds out and he survives, but is captured quickly. His stint as a POW has barely begun, though, when the real nightmare starts. No one at the castle is sure of what’s happening, but the Germans are pretty freaked out by it. No spoilers here, but they have good reason to be. This first issue leaves off in a place where this story could go in a dozen different directions. Which is a fantastic position for a first issue, I think. The art really helps with the wartime feel, too, with a lot of well-colored night scenes (seriously, I didn’t know you could do so much with gray). As war stories go, this is not at all what I was expecting. And it’s got plenty of room to move in any direction (could go horror, or fantasy, or who knows). Pick it up and see where it takes us. 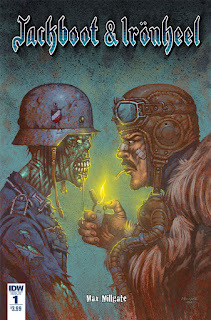 JACKBOOT & IRONHEEL #1 is available now at your FLCS or at idwpublishing.com.